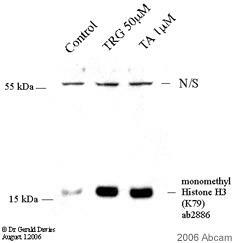 Reacts with Mono-methyl K79 of histone H3. Slight cross-reactivity to di-methyl K79. Synthetic peptide within Human Histone H3 aa 50 to the C-terminus (mono methyl K79) conjugated to Keyhole Limpet Haemocyanin (KLH). The exact sequence is proprietary. This antibody gave a positive signal in the following lysates: calf thymus histone; HeLa; NIH3T3; rat testis tissue. Our Abpromise guarantee covers the use of ab2886 in the following tested applications. ChIP Use 2µg for 106 cells. Immunodiffusion Use at an assay dependent concentration. WB 1/1 - 1/500. Detects a band of approximately 17 kDa. PepArr Use a concentration of 0.2 - 0.02 µg/ml. Chromatin was prepared from U2OS cells according to the Abcam X-ChIP protocol. Cells were fixed with formaldehyde for 10 min. The ChIP was performed with 25 µg of chromatin, 2 µg of ab2886 (blue), and 20 µl of protein A/G sepharose beads. No antibody was added to the beads control (yellow). The immunoprecipitated DNA was quantified by real time PCR. Primers and probes are located in the first kb of the transcribed region. Additional bands at: 17 kDa. We are unsure as to the identity of these extra bands. All batches of ab2886 are tested in Peptide Array against peptides to different Histone H3 modifications. Six dilutions of each peptide are printed on to the Peptide Array in triplicate and results are averaged before being plotted on to a graph. 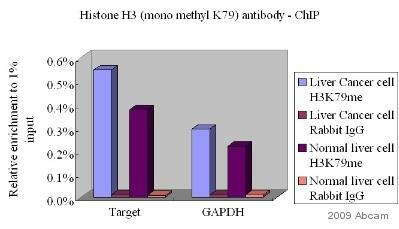 Results show strong binding to Histone H3 - mono methyl K79 peptide (ab4555), indicating that this antibody specifically recognises the Histone H3 - mono methyl K79 modification. This image was kindly supplied as part of the review submitted by Dr Geza Fejes-Toth. Chromatin was prepared from whole cell lysate of normal rat liver and liver cancer cells. The cross-linking (X-ChiP) technique was used, crosslinking was performed for 15 minutes in formaldehyde. 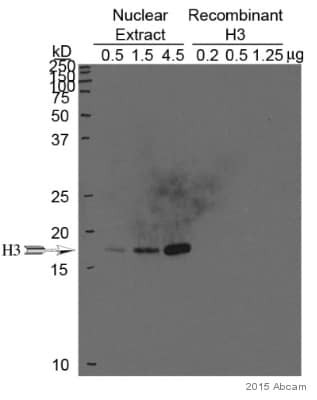 5 µg of the primary antibody was used in 1/100 dilution and it was incubated with the sample for 16 hours at 4°C in a commercially available ChIP dilution buffer. The immunoprecipitated DNA was quantified by real time PCR. ChIP results show that the Histone H3 (mono methyl K79) and GAPDH genes are expressed in higher levels in liver cancer cells than in normal liver cells. 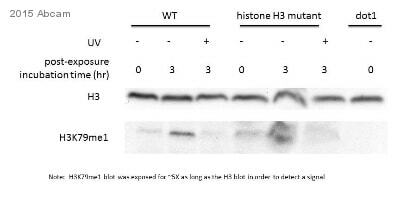 Histone H3 (mono methyl K79) was immunoprecipitated using 0.5mg Hela whole cell extract, 5µg of Rabbit polyclonal to Histone H3 (mono methyl K79) and 50µl of protein G magnetic beads (+). No antibody was added to the control (-). Proteins were eluted by addition of 40µl SDS loading buffer and incubated for 10min at 70oC; 10µl of each sample was separated on a SDS PAGE gel, transferred to a nitrocellulose membrane, blocked with 5% BSA and probed with ab2886. Secondary: Clean blot (HRP conjugate) at 1/1000 dilution. Band: 18kDa: Histone H3 (mono methyl K79). Publishing research using ab2886? Please let us know so that we can cite the reference in this datasheet.